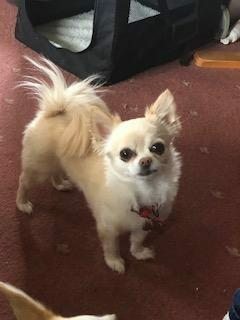 Missy is a 4 year old female Chihuahua, she is looking for an understanding, patient child free home. Missy I believe has previously been subjected to a rather heavy hand, she is very fearful on intro and will bark at you, she will settle once she realises you’re no threat. It took her foster 3 days before Missy would allow her to be stroked and offered a lap for comfort. Missy is dog friendly and currently in a multi dog household without issues. Missy would very much benefit with having a well balanced friend to show her the worlds not all bad. Missy has been vaccinated, spayed, microchipped, flea & worm treated. Being fostered in Leigh on sea Essex. For further details about adopting a dog from foster home based Change A Paw Life Rescue in Hockley, Essex please email changeapawliferescue@outlook.com or telephone 07863 253627. We are a small non profit making rescue based in Hockley, Essex. Our policies are to neuter/spay, vaccinate, de-flea & worm before re-homing. Adoption fee is £150-£200.